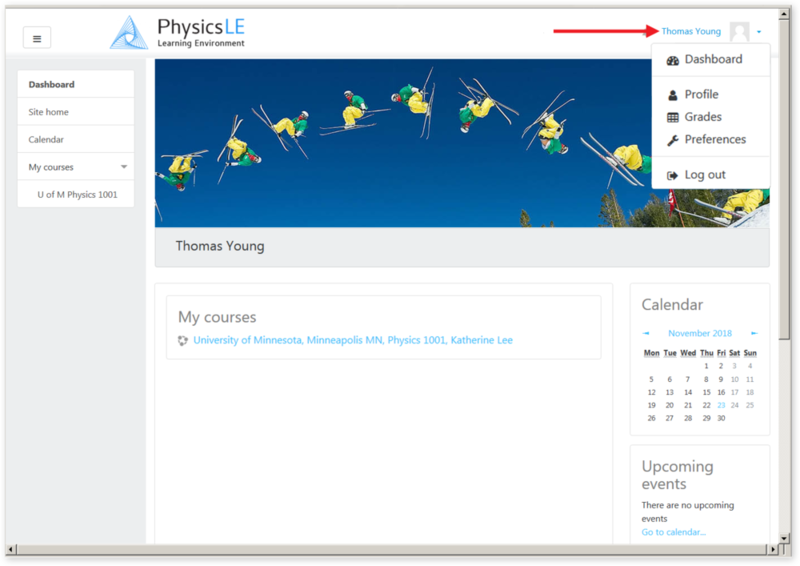 Physics LE is an online learning environment which integrates with your physics course, providing assistance with managing and working through homework assignments & quizzes. When working on assignments you’ll receive immediate feedback, with many problems employing intermediate problem-solving steps to help guide you through the problem. You’ll receive a unique version of the problem as randomized values are extensively used. Submission of assignments & quizzes takes place automatically upon their completion, giving you an up-to-date grade report at all times. When you first login to Physics LE you are brought to the Dashboard page. Your name is shown in the upper-right corner and below the main image. A Calendar appears on this page which your instructor may elect to use to show assignment and quiz deadlines. Clicking your name in the upper-right corner will cause the User Menu to appear. (The User Menu is accessible from any page within the site.) From this menu you can access Profile to edit your profile information. This is also where you go to Log out. When you first login to Physics LE you are brought to the Dashboard page. Clicking your name in the upper-right corner will display the User Menu. Note: All images in this Student Guide can be enlarged by clicking on the image. In the Side Navigation Menu, click on your course name (under My courses) to be brought to the Course page. 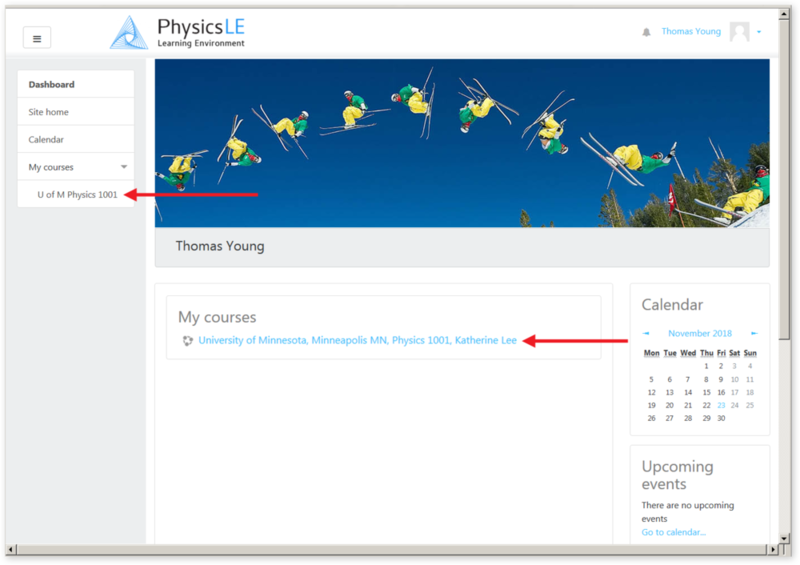 The Course page is the central focus of the Physics LE site. Here you’ll see all the homework assignments & quizzes your instructor has set up for you. Simply click on an assignment or quiz to start working on it. 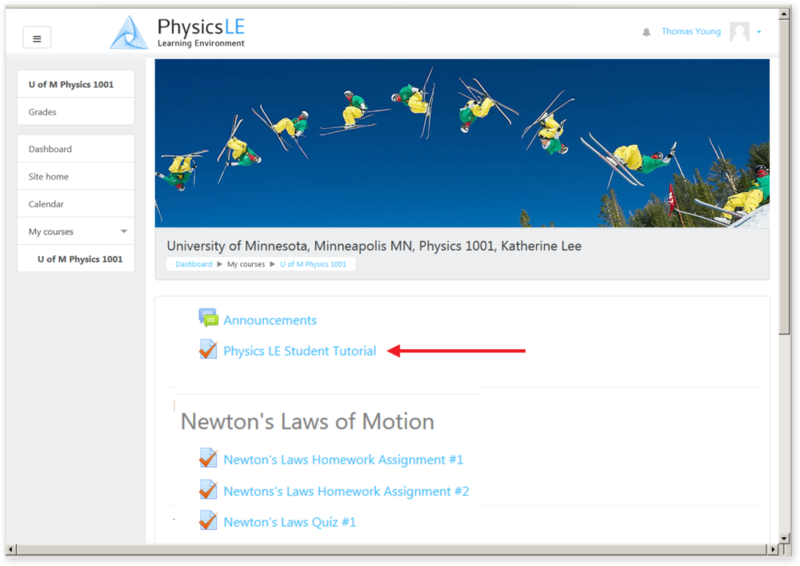 Before starting an assignment or quiz it’s essential to first complete the Physics LE Student Tutorial found on the Course page. This tutorial contains important information on properly working through assignment & quiz problems. 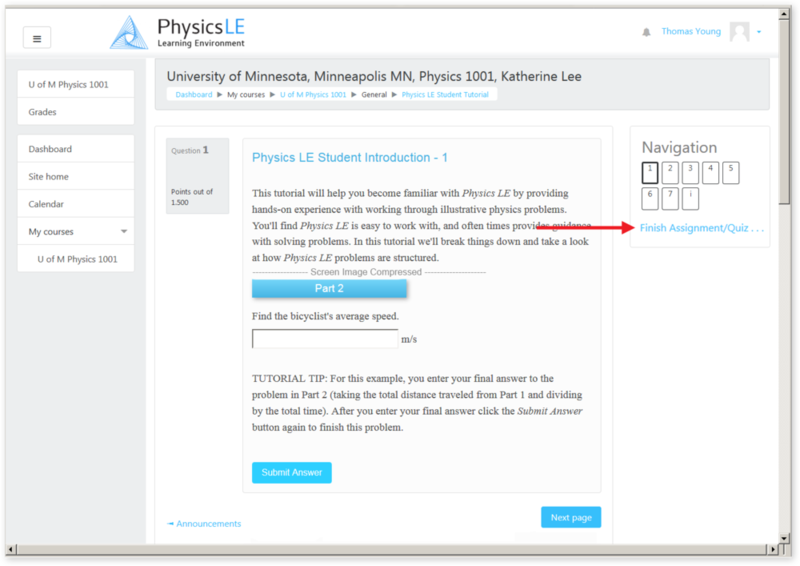 You may find it helpful to log in to Physics LE and start the student tutorial now, while following this guide in a separate browser window. All assignments & quizzes will appear on the Course page. The Physics LE Student Tutorial is also found here. After clicking Physics LE Student Tutorial the Assignment/Quiz Status page will appear. (The Physics LE Student Tutorial behaves in the same way as all homework assignments & quizzes.) This page will display information and options which change depending upon the state of the assignment or quiz (e.g., not yet started, in progress, or completed). When you first start an assignment or quiz you’ll see the Attempt Assignment/Quiz now button. Click this button to begin. This page appears after clicking on an assignment or quiz on the Course page. The information and options will change depending upon the state of the assignment or quiz. To start an assignment or quiz, click Attempt Assignment/Quiz now. The Assignment/Quiz Problems will appear after clicking Attempt Assignment/Quiz now. The Navigation pane in the upper-right corner allows you to access all the physics problems making up the assignment or quiz (in this case the tutorial problems). The Submit Answer button at the bottom should be clicked after you enter your answer. The Navigation pane in the upper-right corner allows you to move between problems which make up the assignment or quiz. The Submit Answer button should be used after answering each part of a physics problem. Click Finish Assignment/Quiz in the Navigation pane after completing all problems in the assignment or quiz. Click Finish Assignment/Quiz after completing all problems in the assignment or quiz. The Assignment/Quiz Summary page will appear after clicking Finish Assignment/Quiz. Here you’ll see a summary of the score received for each problem. In the Status column, the display Problem may be attempted multiple times indicates the problem may not have been attempted yet, it could also indicate the problem (or a part of the problem) was not answered correctly. You can use the Return to problems button to make additional attempts at solving a problem. You can make sure you attempted all problems by simply viewing the Score column, a score will be shown for every problem you attempted, a blank entry indicates you have not yet attempted the problem. When you’re ready to submit the entire assignment or quiz, click Submit all and finish at the bottom of the page. This page shows a summary of the status and score received for each problem. When you’re ready to submit the entire assignment or quiz, click Submit all and finish. 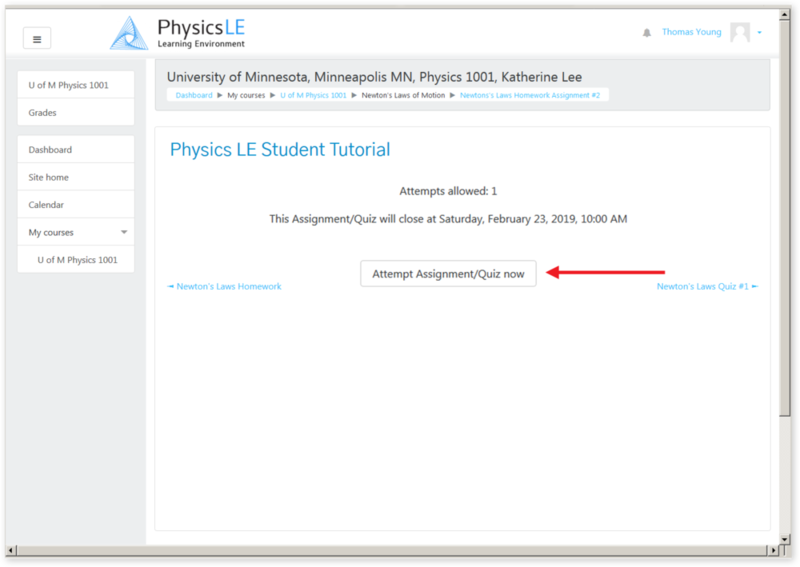 When working on an assignment or quiz, you can log off at any time from your Physics LE account and your submitted work will be automatically saved. You can log in at a later time to pick up where you left off. Note that if an answer is entered in an input field but the Submit Answer button is not clicked, that answer will not be saved. To resume an assignment or quiz that was previously started, simply go to the Course page and click on the assignment or quiz. The Status page will show the button Continue the last attempt. Click this button to pick up where you left off. You can resume working on an assignment or quiz by going to the Course page and clicking on the assignment or quiz. On the Status page, click Continue the last attempt. Physics Fundamentals eBook by Vincent Coletta (960 pages) is bundled with Physics LE and can be accessed from any page within the site by clicking on the textbook image located in the footer. The eBook will open in a new browser tab, so it can remain open as you switch between it and the Physics LE site. You can click on any topic in the table of contents to quickly go to that page. To return to the table of contents type "i" into the page number field. Physics LE Student Guide and Physics LE Tech Support can also be accessed through links located in the footer of every page. Be sure to read through the entire Physics LE Student Guide and refer back to it when necessary. Note that the Physics LE Student Guide is readily accessible when working on homework problems. The Physics Fundamentals eBook and Support can be accessed from any page within the site by scrolling to the footer of the page.